For the 66th instalment in Crime Watch's 9mm series, I thought I would bring you an interview with a new-to-me European author whose work is now available in translation: Spanish crime writer Antonio Hill. I met Hill at last month's Theakstons Old Peculier Crime Writing Festival in Harrogate, and got to chat to him a bit, which was great (see image below). One of the fantastic things about such festivals is getting exposed to new authors, or authors you hadn't heard of before. Hill appeared as part of a 'crime in translation' panel chaired by Barry Forshaw on the Sunday morning, alongside Swedes Liza Marklund and Camilla Lackberg, and South African Deon Meyer, and it was great to see so many people in the signing line afterwards with a copy of THE SUMMER OF DEAD TOYS (Hill's debut, now translated into English), keen to give a newer author a go. Hill works as a translator himself, translating books into Spanish. A psychology graduate, born in Barcelona, he has also worked in publishing as an Assistant Editor. 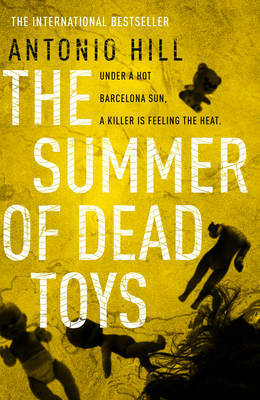 THE SUMMER OF DEAD TOYS, set in contemporary Barcelona, introduces Inspector Hector Salgado, an intriguing detective with a complicated past and violent tendencies. It became something of an instant hit last year, selling more than 80,000 copies in its first two weeks, and has since been picked up for publication in more than fifteen countries. Hill's second crime novel, which sees the return of Hector Salgado, LOS BUENOS SUICIDAS, will also be translated into English, which is great news. 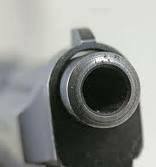 But for now, Hill stares down the barrel of 9mm. I like many of them, from Hercules Poirot to Lew Archer, but also like very much crime novels without a guy in charge of the investigation. That's easy. I had read many books as a boy, but during teenage I stopped reading. I got a bit bored with the stories I was supposed to read at 15/16 and (I guess) there were other things in life that looked more appealing than reading in my room. But, suddenly, I got a copy of John Irving's The World According to Garp, and I was so fascinated by the story and characters than I started reading again. Barcelona is a very touristic city and it's difficult to find spots that are not included in guides, but I would take them to Tibidabo (not the park, the area) and have a good drink in one of the bars with impressive and quiet views of the city. That's difficult. I'd love to say Brad Pitt but I'm afraid I'm more Al Pacino style. Let's say Edward Norton. I have only two books published and like them for different reasons. The Summer of Dead Toys has given me more than any other work project in life, and the second one "The good self-murderers" has also been extremely well received by reviewers. It's given me the respect of those reviewers that thought that The Summer could be a one book success. I was a bit overwhelmed (the first edition was of 65.000 copies and the bookshelves were invaded by the novel). Honestly I got a bit afraid and went back home, thinking it was too much. Then, when it began to sell well, I of course celebrated it with my people. Haven't had many unusual experiences by now. Perhaps the most unusual was a lady, with a chinese adopted daughter, who came to the place where I was signing and bought the book. She asked me to dedicate it, and when I asked her name, she said: Gloria, who is a character of the novel who has an adopted chinese daughter... She had not read the book yet and she could not understand why I was surprised! Have you read THE SUMMER OF DEAD TOYS? Did you meet Antonio Hill at Harrogate? Do you enjoy translated crime fiction? Have you ever been to Barcelona? Thoughts, comments, and stories all welcome.